Why it is important to get Ductwork Installation & Maintenance done from Professionals? Most buyers overlook the importance of getting professional ductwork installation specialist for furnaces and air conditioners. When the users seemingly find the quality of air not up to the mark, they are obviously dissatisfied with the service provided by the agency. However, the fault lies in the quality of ductwork installation which not only affects the quality of blowing air, but also comes across as a possible breeding ground for diseases and allergens. Why focus on ductwork quality? Due to growing concern on the quality of the indoor air and temperature, experts in HVAC systems try to convince the house owners to ensure proper ductwork installation and routine maintenance. The ducts can get really dirty if you are living in a prominent metro city in Canada. Due to continuous operations, it could be highly difficult to cut down the supply of air to the duct work and take out time just to clean them. Hence, it is important to ensure quality ductwork installation that allows multiple access points and vantage sites to get them cleaned on a regular basis, without ripping through the existing layout. 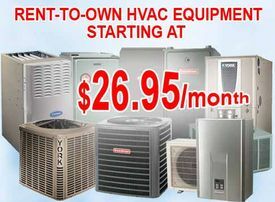 HVAC contractors Toronto offer professional services using manual and automated cleaning kits. Use of vacuum tubes, blowers and brushes allow the professionals to clear the blocks and clogs from the heat pump, blower vents, intake and exhaust ducts and also from the stationary lines. Duct cleaning services are also extended to parts like air handler, filters, vents, motors, housing and bearings, and HVAC Fan coil units. Advanced high-efficiency gas furnaces are tested for their thermostat sensors and how they are working in different temperatures. In order to get the full benefits of the HVAC system, always choose an installation and maintenance support from reputed contractors in Toronto. How to identify them? In Toronto, furnace rental service providers recommend professional ductwork installation and maintenance for air conditioners and furnaces for safe, healthy and 100% quarantined eco-system.